Members of the copyright industry and their political allies are currently waging an EU lobby battle over proposed copyright exceptions. For the 285 million blind and visually impaired people globally, such exceptions would provide better access to a wider range of print publications, but industry is fiercely protective of its intellectual property rights. The global Marrakesh Treaty was agreed in 2013 under the auspices of the World Intellectual Property Organisation (WIPO). It sets out exceptions and limits to copyright rules so that people unable to use print media (including blind, visually impaired, and dyslexic people) can access a far greater range of books and other written materials in accessible formats. These exceptions to copyright law are important in helping to combat the 'book famine' for print-disabled readers. The Marrakesh Treaty is particularly important in global south countries where the range of materials in an accessible format – usually expensive to produce and disseminate – can be extremely limited. How the EU implements the Treaty is crucial, given the majority of books in accessible formats are produced in EU member states. In the years before the Treaty was negotiated and finalised, the publishing and entertainment industries around the world were vociferous in lobbying against it. They argued that a voluntary approach between publishers and civil society would be the best way to ensure that print-disabled people received access to reading materials. As the Treaty became more and more likely to be passed, other corporate lobbyists joined the fray. For example, one of Europe’s biggest and most influential lobby groups BusinessEurope argued that Treaty negotiations should be delayed as they risked “global intellectual property rights weakening”. Even non-affected industries such as Caterpillar, the machinery manufacturer, joined the campaign to oppose it, apparently convinced that the Treaty would act as a slippery slope towards weaker intellectual property rules elsewhere. The EU eventually signed the Treaty in 2014, having previously opposed it; but the ratification process (which would actually introduce the Treaty into EU law) has been slow and subject to further corporate interference and member state procrastination. Objections from some member states in the Council to the Marrakesh Treaty have been present from the beginning, a fact that has been used to delay EU ratification. Eight member states – Finland, France, Hungary, Italy, Lithuania, the Czech Republic, Romania, and the UK – argued that the matters within the Marrakesh Treaty were not an EU competence, although the European Court of Justice has recently rejected this view. The World Blind Union’s David Hammerstein criticised the delays, complaining that “a group of EU member states in the Council have made us needlessly lose over three years in being able to help the right to read of millions of visually-disabled persons inside and outside the EU” while the European Parliament similarly expressed its "profound indignation”. Member states in the Council have further dragged their feet by arguing that they could not ratify the Treaty until new legislation was in place to implement it, namely an EU directive to harmonise the rules between member states, and a regulation to govern cross-border exchanges with third countries. But new legislation not only delays the on-the-ground implementation of the Treaty provisions, it also opens up the possibility of negative amendments being introduced to weaken the Treaty. Now after much delay, the Commission has finally produced draft directive and regulation proposals to introduce the Treaty across the EU. These have been fairly well-received by groups representing print-disabled people, including the European Blind Union which urged EU politicians to “show a clear commitment to ratifying the Marrakesh Treaty” and to do so “with no added barriers nor new administrative burdens”. In a statement the International Federation of Library Associations also urged politicians to “Give access, don’t take it away". But these groups remain very concerned about possible amendments on copyright. Compensation to publishers when organisations turn a document into an accessible format, which campaigners argue would add to the already high costs of putting the document into such formats, alongside the existing cover purchase price. A clause on ‘commercial availability’ which would, for example, create uncertainty about which books from overseas could be made available domestically, or prevent accessible books from being placed in lending libraries if they are already available to buy. The latter would arguably be a form of discrimination against print-disabled people considering that sighted people can borrow library books that can also be bought in a shop. A proposal that there should be a mandatory register of ‘authorised entities’ who would be the only ones able to make accessible-format books. Industry argues that this would reduce piracy and ensure quality; some campaigners worry this could be a further bar to the production and dissemination of accessible-format works. Industry’s lobby efforts have attempted to re-frame the Marrakesh Treaty away from being a matter of human rights, education, and social justice, towards a copyright agenda by portraying it as a threat to business’ interests. 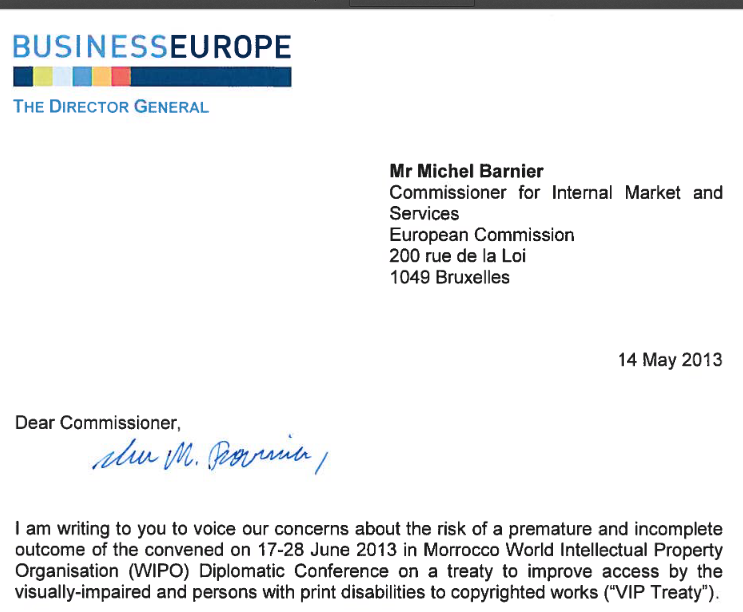 But contrary to the obvious benefits of the ratification and implementation of the Marrakesh Treaty for the 30 million blind or visually-impaired people in Europe (and 285 million worldwide), several EU member state governments have instead bought the business line that these issues should be viewed through the lens of copyright. The German government has been very active on the Marrakesh Treaty. Official reports by an attaché at the German permanent representation to foreign ministry colleagues explaining discussions held at the Council working group on intellectual property (which have been seen by Corporate Europe Observatory) are very revealing. They report that during several meetings held in November – December 2016 at which the Marrakesh Treaty was discussed, the German government repeatedly spoke in favour of compensation provisions (together with Spain, Austria,Finland and others), a position in line with business’ arguments. The German government in particular has been pushing hard to include strong publisher compensation rights in the Marrakesh Treaty, which exist in a controversial draft form as part of a separate EU level directive, the “Copyright in the Digital Single Market" (DSM) directive. Its rationale for the inclusion of this directive’s article on publisher compensation (Article 12 DSM) in the Marrakesh Treaty is the shortcut it would provide for anchoring such a provision in EU law, as the DSM directive itself looks set for a lengthy legislative battle. The German government further used the Reprobel judgement of the European Court of Justice (which invalidated existing German provisions for publishers’ compensation) to justify swift action. Of course loading the Marrakesh Treaty with extra content is just what print-disabled people’s rights’ campaigners fear, especially as article 12 of the proposed DSM has yet to have any proper scrutiny in the European Parliament. In fact the German government has gone to extraordinary lengths to promote its view during the legislative process on the Marrakesh Treaty. 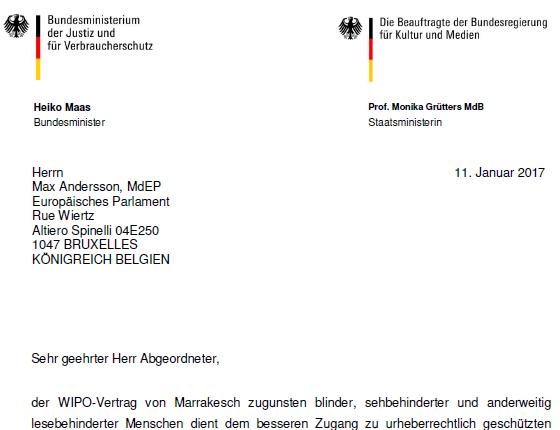 In particular, the German permanent representation in Brussels sent to several MEPs (the Green MEP Max Andersson who is the rapporteur on both the regulation and the directive on the Marrakesh Treaty; and two German MEPs: centre-right Axel Voss and centre-left Dietmar Köster) a letter from the German government formally requesting they include these publishers’ compensation provisions. This letter can be read in English translation here. This is a very unusual intervention by the German government in the work of the European Parliament and Max Andersson wrote back on 9 February to explain why he rejected its proposal. Shortly after, on 23 February, a further letter was sent to Max Andersson, this time from the Börsenverein des Deutschen Buchhandels (German book trade association) to explain the rationale for the German government’s intervention! This makes it look like there was close cooperation – should we even say collusion? – by an EU member state and commercial interests. Notwithstanding this highly unusual intervention detailed above, the big German publishing houses themselves have not been visibly active on the Marrakesh Treaty dossier; perhaps they realise that it would be foolhardy to be seen to be opposing a treaty aimed at helping print-disabled people access more books. Lobbying has instead been undertaken by other industry actors, such as the collecting societies including Wort, (which collects copyright dues on behalf of publishers and authors) and the German Cultural Council, both of whom have been active in supporting compensation provisions under the Marrakesh Treaty. The German senate (the Bundesrat) has also discussed the Marrakesh Treaty and was asked by the Börsenverein des Deutschen Buchhandels (German book trade association) to delete Commission proposals aimed at preventing compensation. But ultimately, the Bundesrat has not supported that position. 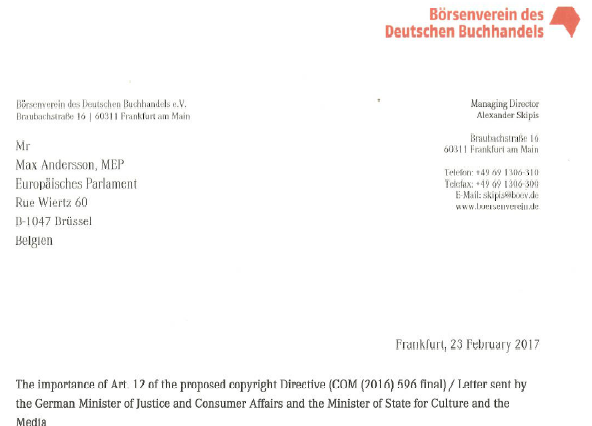 The extent of German government support for the copyright industry’s proposals to amend the Marrakesh Treaty seems strange, particularly considering the outcome in the Bundesrat and the risk of negative publicity. The only explanation, say campaigners, is behind-the-scenes industry lobbying and scaremongering that weakening copyright rules in this context will be the beginning of a slippery slope. The Publishers’ Association (PA) in the UK has also been active on the Marrakesh Treaty. While careful to preface its comments with “support” for the Treaty, a PA submission to the UK government on the Commission’s copyright proposals in December 2016 pushed the inclusion of commercial availability, compensation, and language on authorised entities as well as supporting the call “from our German colleagues for the passage of [Article 12 of the draft DSM] to be expedited”. A glance through its newsletters for 2016 (those for 2017 are not publicly available) reveal a long list of contacts with UK and EU officials and decision-makers (even though the PA is not currently a member of the EU lobby register). And it seems like the UK government is listening. The UK government’s position, as articulated to the Parliament’s second chamber (the House of Lords) in November 2016 highlights the commercial availability provision already in place in UK law, and potential “negative” effects” if the Marrakesh Treaty were to override that. Further evidence seen by CEO shows that the UK government continues to defend provisions on commercial availability. Furthermore, in January 2017, the UK made a formal proposal within the Council to introduce the commercial availability issue and allow compensation for publishers. In another German permanent representation report (seen by Corporate Europe Observatory) about the 31 January 2017 discussion at the Council working group on intellectual property, many member states apparently expressed the view that the UK’s proposal “goes in the right direction” (including France, Germany, Spain, Sweden, Austria, Denmark and the Netherlands). The concern of print-disabled people's rights' campaigners is that the UK which has commercial availability provisions already in domestic law are now demanding to allow them across the EU via the Marrakesh Treaty, just to preserve domestic provisions, with little concern for how this will impact upon the future rights of print-disabled people to get accessible-format reading materials. At the time of writing, the latest proposals tabled by the Presidency of the Council (Malta) on the Marrakesh Treaty are not publicly available. But Corporate Europe Observatory has seen papers which were due to be discussed on 8 March 2017 at the Council working group. The European Blind Union and World Blind Union have written to all 28 EU member states to express their concern that the ‘commercial availability’ and compensation clauses are no longer explicitly ruled out, indeed compensation is now specifically included, and calling this a ““make or break” issue to achieve positive EU legislation for visually-impaired persons”. We understand that COREPER (the top decision-making committee in the Council) will consider this matter on 22 March. The way that member states appear to be toeing the corporate line over the Marrakesh Treaty has raised serious concerns about transparency and accountability, particularly in the Council. Council decision-making is not easy to track, especially on a live dossier such as the Marrakesh Treaty. Few papers are proactively published and, if they are, can be significantly delayed. When CEO requested minutes of the Council working group on intellectual property (copyright) we were told that the group “does not draft minutes, outcome of proceedings documents or equivalent documents”. Meanwhile, neither the Council nor member states in the form of the permanent representations in Brussels are part of the (voluntary) EU lobby transparency register, nor do they proactively publish their lobby meetings. The Commission proposes that the Council joins the revised lobby register (negotiations upon which will start soon), but the likelihood of the Council and all 28 permanent representations joining a revised register are next to zero. Moreover, a comprehensive study conducted on behalf of the European Parliament on the slow progress of the ratification of the Marrakesh Treaty included a questionnaire to the 28 EU permanent representations to try to better understand member state positions. The report says that “only one reply was received” from the 28, and that it was “without concrete answers to our questions.” This fits a familiar pattern. In 2016, the Alliance for Lobbying Transparency and Ethics Regulation published a report which showed that of 17 permanent representations asked, only 4 would provide requested information on recent meetings held with lobbyists; 6 countries said they did not record information about lobbyists met (including Germany); 2 refused to supply the information that they did hold (including the UK); and 5 did not answer at all. 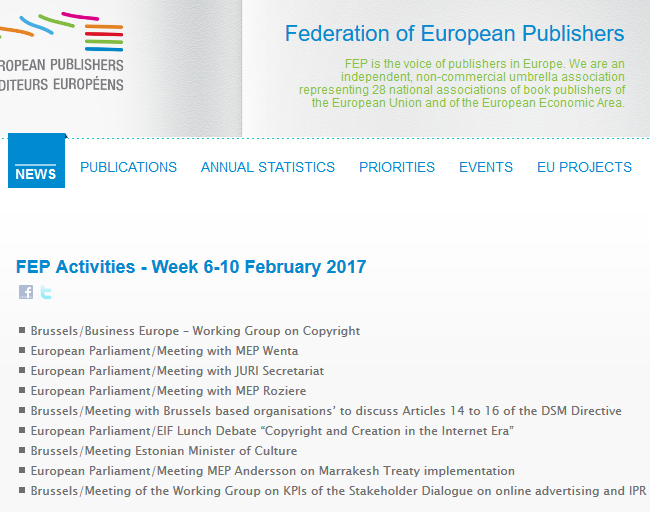 In the run up to Parliamentary discussions on the Marrakesh Treaty, the Federation of European Publishers (FEP, the trade association based in Brussels) has been active, especially on the ‘commercial availability’ and ‘authorised entities’ issues, as evidenced by its briefing circulated to MEPs. A scroll through its activities in recent weeks and months (as found on its website) indicates a high-level of engagement with all three EU institutions, including MEPs. FEP has met the following MEPs from crucial committees scrutinising the Marrakesh Treaty (the Legal Affairs (JURI) and Culture and Education (CULT) committees), or their assistants, between December 2016 and February 2017: Giorgos Grammatikakis (CULT member), Marc Joulaud (CULT substitute), Bogdan Wenta (CULT member), Virginie Rozière (JURI substitute), Max Andersson (JURI member), Lidia Geringer de Oedenberg (JURI member), Mady Delvaux-Stehres (JURI member), Therese Comodini Cachia (JURI member), Algirdas Saudargas (CULT substitute), Angel Dzhambazki (CULT member, JURI substitute), Mary Honeyball (JURI member, CULT substitute) and Axel Voss (JURI member). Max Andersson (Sweden, Green) is the rapporteur on both the Marrakesh Treaty regulation and the directive for the Legal Affairs (JURI) committee. He is a strong advocate of ratification of the Marrakesh Treaty as soon as possible and in a way which respects its key principles. Amendments for the directive show that Angel Dzhambazki (Bulgaria, European Conservatives and Reformists) and Sajjad Karim (UK, European Conservatives and Reformists) have proposed an amendment whuch could allow compensation and ‘commercial availability’ (amendment 36). The JURI vote on this and other amendments will be held on Thursday 23 March. Meanwhile the Culture and Education (CULT) committee’s opinion on the Marrakesh Treaty directive, was also subject to pro-industry amendments. Both Marc Joulaud (France centre-right) and Bogdan Wenta MEP (Poland, centre-right) tabled amendments which caused concern to the defenders of print-disabled people’s rights, including on compensation and commercial availability (37 and 70). Another MEP, Sabine Verheyen (German, centre-right) proposed amendments which included a whole paragraph from the Commission’s DSM proposal on copyright and compensation (57, 58, 75). When these amendments were voted on in late February 2017, they were rejected by the CULT committee. An amendment on authorised entities (amendment 9b in this final version) was accepted which some campaigners consider could set-up further barriers to global access; MEPs argue it will reduce the risk of privacy and drive up quality. The CULT report by Helga Trüpel MEP (Green, Germany) was finally accepted unanimously by the committee. All data in this table correct as of 16 March 2017. Campaigners for print-disabled people’s rights say that the fate of the Marrakesh Treaty in the EU is crucial because the majority of books in accessible formats are produced in EU member states. Without the active and effective sharing of these books which the Marrakesh Treaty aims to promote, millions of mainly poor print-disabled people in the global south will not gain access to these resources in key languages such as English, Spanish, and French. The EU rules which implement the Marrakesh Treaty will be used as a template for others, including in the US, where the ratification process is quite advanced but also coming under strong industry pressure. So it is really important that the EU institutions get the Treaty ratification process right. But in the EU, the Marrakesh Treaty is at risk of being reframed as a copyright issue. In the long fight to secure the Treaty, industry voices initially opposed it and it was only thanks to the tenacity of campaigners and governments (especially in the global south) that led to it being negotiated and agreed. This forced industry lobbyists to narrow their demands and act more subtly to put forward their views. 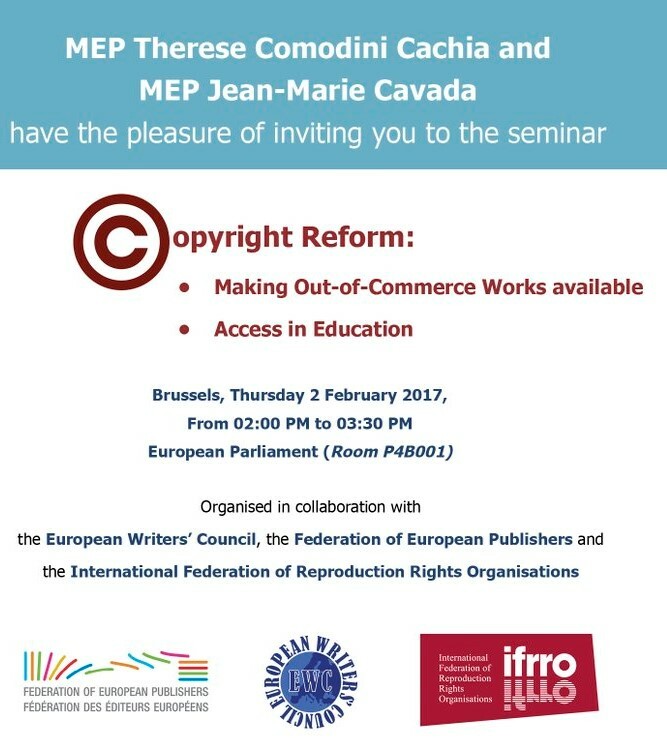 But the copyright industry, including publishers, are actively lobbying MEPs and member states. The latter are not only listening, they have adopted industry’s cause. Too many member states appear to have forgotten that they should be driven by the public interest, and not the economic interests of specific industries. After this week’s vote in the JURI committee in the Parliament and the subsequent plenary vote, the trialogue process to agree the ratification of the Marrakesh Treaty will begin. EU decision-makers, particularly among the member states in the Council, need to focus on the key objective of the Treaty: ending book famine in the EU and around the world. And with deliberations in the Parliament and the Council on the Commission’s proposed – and highly controversial – Copyright Directive to follow swiftly on its heels, the Marrakesh Treaty can be seen as an early warning of the lobby battle on copyright which is yet to come. Yesterday, the Council (in a meeting of COREPER, the Committee of Permanent Representatives in the European Union) accepted the Maltese Presidency’s proposal for a Council position on the Marrakesh Treaty, upon which it will start negotiating with the other institutions. Disappointingly, the Council position includes several elements for which industry had been lobbying, and which were opposed by campaigners for print-disabled people’s rights. These include the “flexibility” for member states regarding compensation and commercial availability. This is a contradiction to the Commission’s proposal which had firmly ruled out these kind of loopholes. Further analysis of the Coreper position has been provided by Intellectual Property Watch. Meanwhile, today the Legal Affairs committee in the European Parliament rejected proposals to include compensation and commercial availability (including amendment 36 mentioned above), thereby setting up a tussle with the Council on these matters when the Marrakesh Treaty goes to the trialogue process. Cross-border exchange of books for blind and visually impaired soon a reality. We deeply regret that the final agreement, contrary to the position of the European Parliament and the European Commission but promoted by the publishers lobby through the German and other governments, allows EU member states to impose upon blind persons organizations and libraries the payment of economic compensation for the distribution of accessible formatted copies of copyrighted works despite the fact that this distribution causes no proven harm to rightsholders. The EBU has demanded that member states do not apply compensation schemes at the national level and it points to "a number of suggested safeguards and caveats in the application of these remuneration schemes". Clearly it is good news that the Marrakesh Treaty will soon be implemented in Europe. But it looks as if member states' corporate interests have trumped the interests of print-disabled people when it comes to compensation. It is essential to shine a greater light on the cosy lobbying that takes place between member states and business interests. Last month, the Marrakesh Treaty cleared one of its last EU legislative hurdles with adoption by the European Parliament of the final agreement with the Council. each an international representative for creators, performers or creative industries in its field" in 2008 pre-Marrakesh Treaty. Regardless of what they might say publicly today, this is what may still be on their minds. and the lobbyists for making the life of blind people more difficult, should be blinded for a whole month.